The protests that have swept southern cities over poor services prompted authorities to place Iraq’s security forces on high alert. Hundreds of protesters on Sunday rallied in Basra where police used water cannons and tear gas as some of the demonstrators tried to storm the provincial government building. Abadi, who also serves as the commander in chief of the armed forces, ordered security forces to remain on high alert, Reuters quoted unnamed military intelligence and Ministry of Defense sources as saying. On Saturday, about 100 protesters closed access to the Umm Qasr commodities port near Basra. Port employees said the road leading into the terminal was blocked and trucks had no way of getting in or out. Oil Minister Jabbar al-Luaibi has said that the protesters tried to break into an oil installation in the West Qurna 2 oil field of Basra province. The rallies began in the southern oil hub of Basra last week amid concerns over acute unemployment as well as electricity and water shortages and spread to several other cities, including Najaf, Amara, Nasiriya and Baghdad. Two more protesters were reported killed in Amara overnight Saturday, bringing to three the number of demonstrators who have lost their lives since the unrest erupted last Sunday. Protesters occupied the headquarters of the provincial governorate in Amara, threw stones at branches of the Dawa party, and beat up policemen. It was not clear who killed them but provincial authorities said there had been “indiscriminate gunfire” in the city. Hundreds of demonstrators entered Najaf airport’s main hall and walked onto the tarmac on Friday, but air traffic resumed later after the protesters withdrew. Witnesses said security forces allowed protesters to enter the main airport building. Head of the airport’s administrative council Jawad al-Karawi said certain officials and politicians were trying to economically harm the airport. The holy city of Najaf is a popular destination for Shia pilgrims. Flights to Iran’s holy city of Mashhad also take place from Najaf, with IRNA news agency saying they had been temporarily suspended until further notice. Unidentified calls were posted on social media Saturday for massive demonstrations to take place in Baghdad. Some urged demonstrators to head for the fortified Green Zone, an area out of bounds for most Iraqis where key institutions and embassies including the US and British missions, are located. 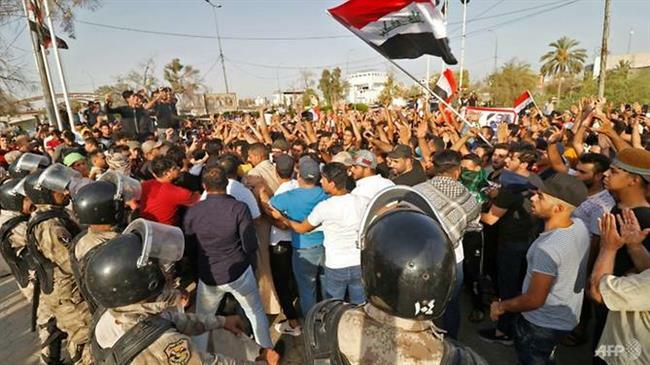 Iraq has seen the growing wave of protests since the beginning of July when temperatures topped 50 degrees Celsius in some Iraqi provinces, especially in Basra. The situation in Basra – an oil export hub for Iraq’s exports – remains tense amid heavy deployment of security forces to prevent the situation from spiraling out of control. Long neglected, Basra is one of the few cities in the Middle East without an effective water treatment system. Many of its waterways are stagnant cesspools, with state officials blaming a public funding crisis caused by years of low oil prices. Abdel Mehdi al-Karbalai, the representative of Grand Ayatollah Ali al-Sistani, said many residents of Basra “are suffering from an extreme lack of public services” as he urged the government to deal seriously with the demands of citizens. “It is not fair and it is never acceptable that this generous province is one of the most miserable areas in Iraq,” he said. “We can only stand with our dear citizens in their demands as we feel their great suffering,” Karbalai added. The Council of Ministers meanwhile said the government will quickly address the demands of the protesters as Iraq’s National Security Council urgently convened a meeting in Baghdad Saturday. Michael Springmann, a former US diplomat, has told Press TV that the ongoing popular outrage is a fallout of United States-led wars against Iraq. “This is the direct result of American wars by George H. W. and George W. Bush in 1991 and 2003,” he said, referring to the US invasions of Iraq. He went on, “Grand Ayatollah Sistani is siding with the protesters because he knows what is happening. Normally, he does not get involved in politics, but this is outrageous and it is the direct result of American warfare and the direct result of American people running the country into the ground,” so they can gain control of Iraqi oil.